Almost six decades ago I was the youngster scraping knees and hands as I climbed an old water oak across from my home. I can still remember the thrill of perching high and hidden, concocting wild and complex imaginary adventures with my friends. 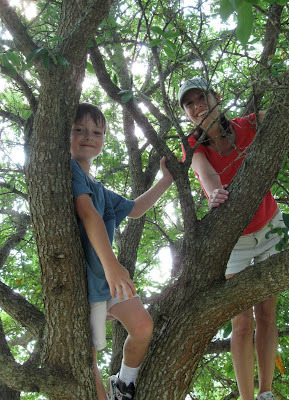 During this visit from grandchildren, however, I left the climbing to Nate and chose the feet-on-the-ground adventure of chasing granddaughters still too young to hear the siren call of a good climbing tree. I get terrified watching the acrobatics my grandchildren get up to in playparks. Trees would be even worse. But that is my problem not theirs - climbing develops special skills, and so Grandma has learnt to squint sideways and hold her breath and pray all is well.